In this article, a parallel radial basis function network in conjunction with chaos theory (CPRBF network) is presented, and applied to practical fault detection for hydraulic pump, which is a critical component in aircraft. The CPRBF network consists of a number of radial basis function (RBF) subnets connected in parallel. The number of input nodes for each RBF subnet is determined by different embedding dimension based on chaotic phase-space reconstruction. The output of CPRBF is a weighted sum of all RBF subnets. It was first trained using the dataset from normal state without fault, and then a residual error generator was designed to detect failures based on the trained CPRBF network. Then, failure detection can be achieved by the analysis of the residual error. Finally, two case studies are introduced to compare the proposed CPRBF network with traditional RBF networks, in terms of prediction and detection accuracy. Fault detection is becoming important because of the complexity of modern industrial systems and growing demands on quality, cost efficiency, reliability, and safety. Early fault detection is an essential prerequisite for further development of automatic supervision. The interest on fault detection techniques would be increasing correspondingly. Hydraulic pump is the power source of a hydraulic system in aircraft. Its performance has a direct impact on the stability of the hydraulic system and even on the entire system. It has been proved based on statistical data that hydraulic pump has a higher fault probability over other mechanical systems, thus, it is specifically necessary to investigate and conduct fault detection techniques for hydraulic pump. In this article, considering the complexity of hydraulic system and its severe working conditions, the data-driven fault detection method is suggested and applies to its online fault detection. Generally, data-driven based fault detection consists of the following aspects: data measurement, data processing, data comparison, and data assessment . Usually, the vibration signal of hydraulic pump is used for fault detection in practice, and artificial neural network (ANN) models have also been widely applied to intelligent fault diagnosis owing to their intrinsic parallel, adaptability, and robustness [2, 3]. Current data-driven based fault detection methods for hydraulic pump pay more attentions to not only linear characteristics but also nonlinear ones. In addition, owing to the universal presence of chaotic phenomena and the intrinsic characteristics and complex operation conditions of hydraulic system, strong nonlinearity and chaotic features can be clearly found from the vibration signals of hydraulic pump. Therefore, the research works on chaos-based fault detection for hydraulic pump should have a high engineering application value. Currently, chaotic correlation dimension has been applied well for condition monitoring and fault diagnosis of hydraulic pump. In addition, some research works based on Duffing oscillator and Lyapunov exponent have been employed to qualitatively or quantitatively solve the incipient fault recognition for hydraulic pump, with good diagnosis performance. However, the method based on neural network in conjunction with chaos theory has rarely appeared, especially for the fault detection of hydraulic pump [4–7]. Among several types of neural networks, radial basis function (RBF) network has relatively high convergence speed, and can approximate to any nonlinear functions. It has been proved that RBF network has a very high performance, in terms of nonlinear time series prediction, fault diagnosis in industrial systems, sensor and flight control systems, etc. [8–14]. A CPRBF network for fault detection of hydraulic pump is presented in this article. This CPRBF network was first trained using the dataset from the normal state without fault of hydraulic pump, and then a residual error generator was designed to detect several types of failures of hydraulic pump based on the trained CPRBF network with one-step prediction of chaotic time series. The proposed model, based on Camastra and Colla's approach  and Yang et al.' method , is able to reduce the effect of cumulative error and improve the prediction accuracy of RBF. This article is divided into three sections as follows: Section "Phase-space reconstruction of chaotic time series" describes the chaotic theory on phase space reconstruction employed to obtain the estimation of correlation dimension. Section "Model of chaotic time series prediction and fault detection" proposes a new CPRBF network for chaotic time series prediction, and a residual error generator based on CPRBF network was also designed to detect fault. Then, Section "Case studies" gives several case studies, including simulation results of one-step iterative prediction and experimental results of fault detection for hydraulic pump. where D is the dimension of system attractor. 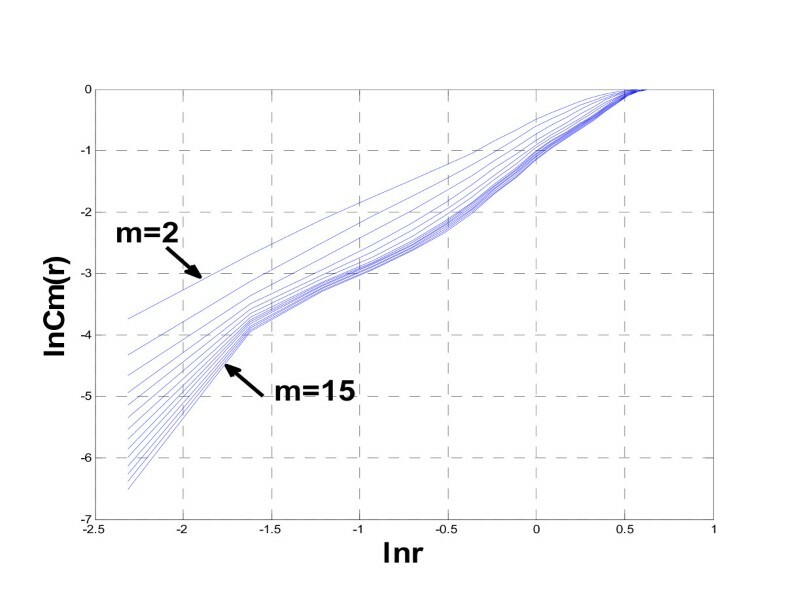 In order to obtain a correct system embedding dimension, starting from the time series, it is necessary to estimate the attractor dimension D.
The algorithm plots a cluster of lnC m (r)-ln(r) curves through increasing m until the slope of the curve's linear part is almost constant. Then, the correlation dimension estimation D can be attained using least square regression. In practice, it is difficult to get the exact estimation value of the minimum embedding dimension through G-P algorithm. 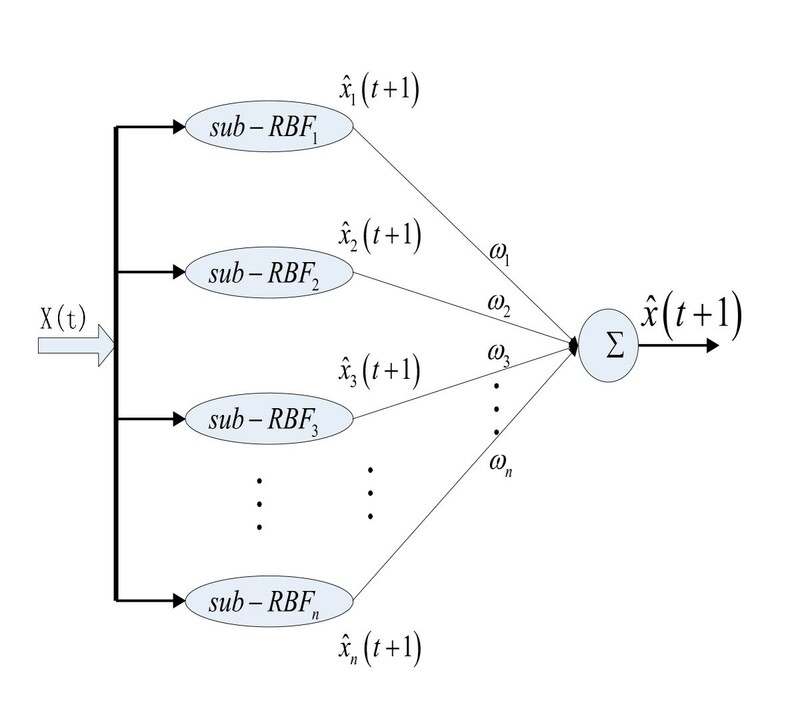 Furthermore, a single RBF network uses the estimation value of minimum embedding dimension as the number of its input, usually resulting in an inaccurate output due to the inaccurate estimation of embedding dimension from human factor. Therefore, a PRBF network consisting of multiple RBF subnets is proposed to increase the system performance with decreased error. The CPRBF is constituted of multiple RBF networks connected in parallel for time series prediction. The structure of a CPRBF is shown in Figure 1. The CPRBF consists of n RBF subnets, which are denoted as sub-RBF i (i = 1,2,...,n), respectively. Each sub-RBF subnet realizes one-step prediction independently at t + 1. After the training of sub-RBF by historical dataset, one-step predicted value x ^ i t + 1 can be obtained. The final predicted value x ^ t + 1 of PRBF can be achieved through proper weighted combination of x ^ i t + 1 . Estimation value of the minimum embedding dimension is regarded as the number of input nodes in the central subnet, and each of other subnets uses different numbers (calculated based on m) as its input size. In this article, each subnet RBF i uses the default parameters: the number of hidden layer is one, and the number of hidden nodes is equal to the number of input vectors. It is necessary to employ weighted factor ω to gain reasonable prediction result because each RBF subnet has different influence on the prediction process. In this article, the optimal weighted value of each subnet is determined according to the minimum predicted absolute percent error (APE) of x ^ i t + 1 in each case. The output of PRBF net is the weighted sum of each individual RBF subnet, and the final predicted result can be represented by the following equation. where x ^ i t + 1 is the output of i th subnet, and x ^ t + 1 is the output of CPRBF network. Then, the least square algorithm is employed to calculate the optimal weighted factors. where N is the number of samples. Residual error generator can be designed for fault detection optimization based on CPRBF network and CPRBF prediction process, and it provides a basis for the analysis and calculation of the model uncertainty robustness. The structure of a residual error generator is shown in Figure 2, where x(t) is the time series which can be observed of actual system, CPRBF is the residual error generator model trained using the dataset under normal state, x ^ ( t ) is the one-step prediction value of system, and e(t) is the output of residual error generator. Structure of residual error generator based on CPRBF network. where reval is a function related to residual error signal and employed to measure its deviation value, Jth is the threshold. The variance of residual error signal can be adopted as residual error evaluation function. The corresponding standard of threshold value can also be determined based on diagnostic experiences in conjunction with different working conditions. 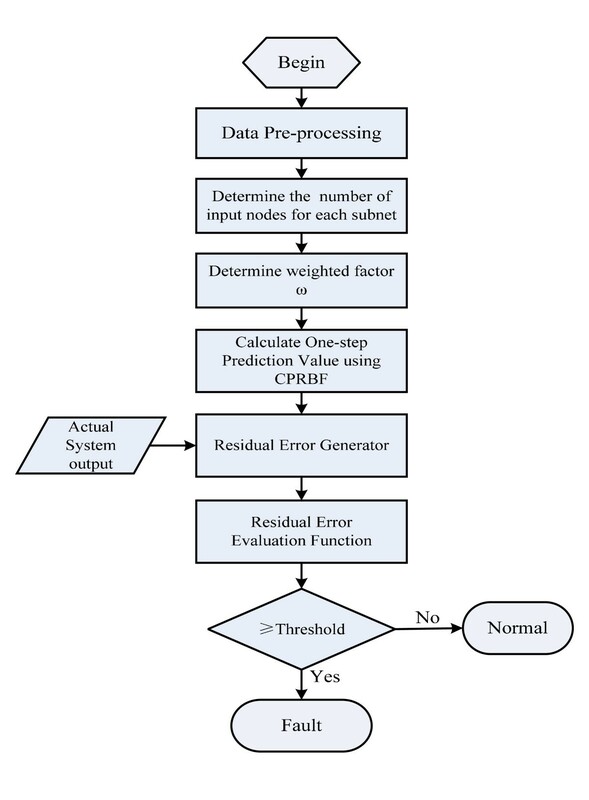 Process of fault diagnosis based on CPRBF and residual error generator is shown in Figure 3. Step 7. Fault can be detected based on the evaluation function, with a fault alarm, once the residual error exceeds the threshold value. Considering the lack of practicability from a common one-step prediction method, one-step iterative prediction should be adopted to verify the prediction performance instead. In general, each predicted result at Step 4 is consecutively used as the next input data to achieve one-step iterative prediction. The future trend of actual case (Lorenz's attractor, hydraulic pump) can be obtained gradually with the repetition of Steps 3 and 4, and the loop times depends on the length of actual expected data. 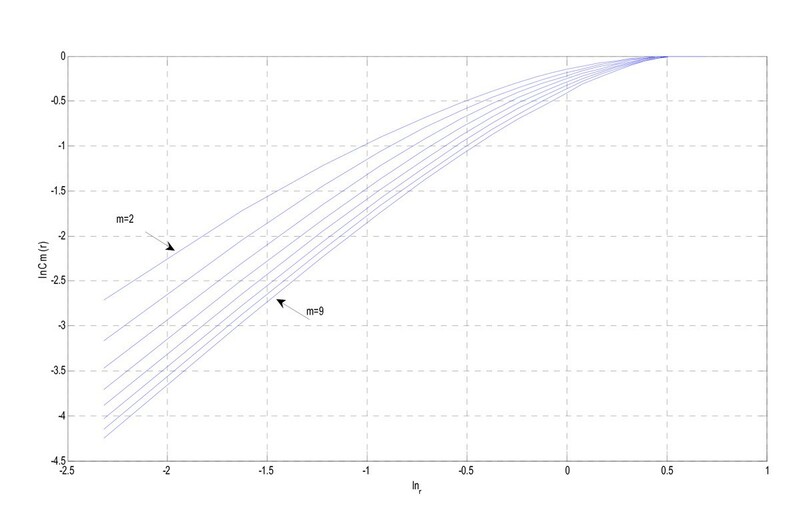 In this section, the simulation result of Lorenz's attractor data is given to verify the performance of the proposed method. Equation 10 is employed to generate the Lorenz's time series data. where σ = 16, r = 45.95, b = 4. 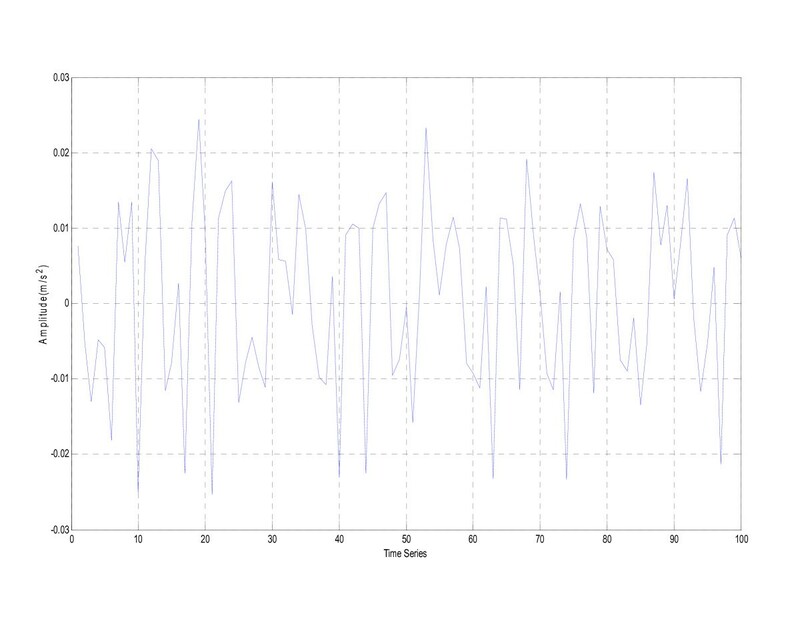 1,000 points of X-component Lorenz time series data were first normalized and used for the following prediction. According to G-P algorithm, a cluster of lnC m (r)-ln(r) curves is plotted with the increase of the embedding dimension m. The correlation dimension can be determined correspondingly, D = 1.7643. According to Equation 2, m = 5 (Figure 4). Plot of ln C m ( r )-ln( r ) of Lorenz time series. As a whole, 1,000 points were divided into two groups (training and testing dataset). The first 800 samples were used for RBF network training. The next 100 samples were used to determine the optimal weighted factor ω, and the last 100 samples for testing of the prediction accuracy between RBF and CPRBF. The number of input nodes of central subnet in the PRBF was 5, obtained from the estimation of the minimum embedding dimension. After the training of each subnet, the optimal weighted factor ω can be obtained via least square algorithm. The parameters of CPRBF are listed as below. Figure 5 shows the one-step iterative predicted result on the last 100 points of Lorenz's time series by CPRBF network. Figure 6 shows the comparison on APE of Lorenz time series between RBF and CPRBF. 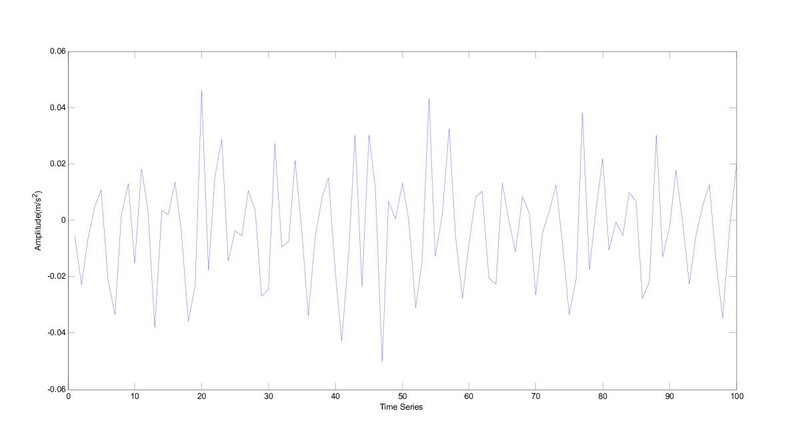 One-step iterative predicted result of Lorenz time series. Comparison of APE between RBF and CPRBF. Comparing with RBF network, CPRBF network has better performance on iterative prediction, in terms of convergence and stability. In this section, several groups of time series data (normal and fault conditions) were generated from a test rig of SCY Hydraulic pump. Table 1 shows the corresponding maximum Lyapunov exponents (λmax) of the above time series. 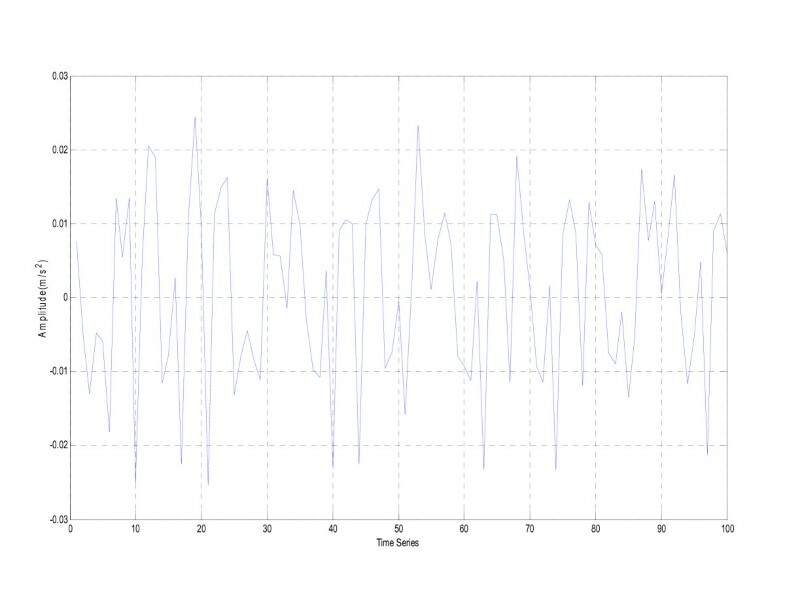 Because all λmax values are positive, the experimental data can be regarded as chaotic time series. 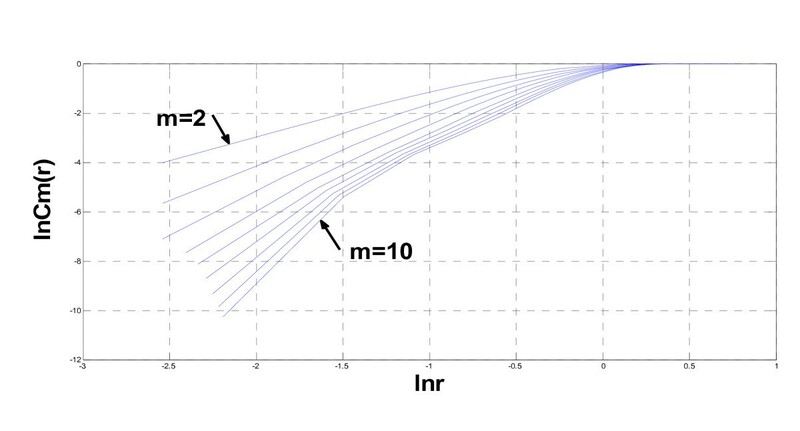 According to G-P method, a cluster of lnC m (r)-ln(r) curves for Data 1 is plotted with the increase of the embedding dimension m as shown in Figure 7. The correlation dimension can be determined correspondingly, D = 2.2346. According to Equation 2, m = 6 (Figure 7). Plot of ln C m ( r )-ln( r ) of hydraulic pump's sample data. Figure 8 shows the result using one-step iterative prediction based CPRBF network. Figure 9 presents the comparison of APE error between RBF and CPRBF, and both are all based on Data 1. One-step iterative predicted result of Data1. Comparing with RBF network, PRBF model has higher prediction accuracy, without the effect of error accumulation. According to the G-P method, a cluster of lnC m (r)-ln(r) curves of normal data is plotted with the increase of the embedding dimension m, as shown in Figure 10. The correlation dimension can be determined correspondingly, D = 2.2472. According to Equation 2, m = 6. Plot of ln C m ( r )-ln( r ) of hydraulic pump's data. 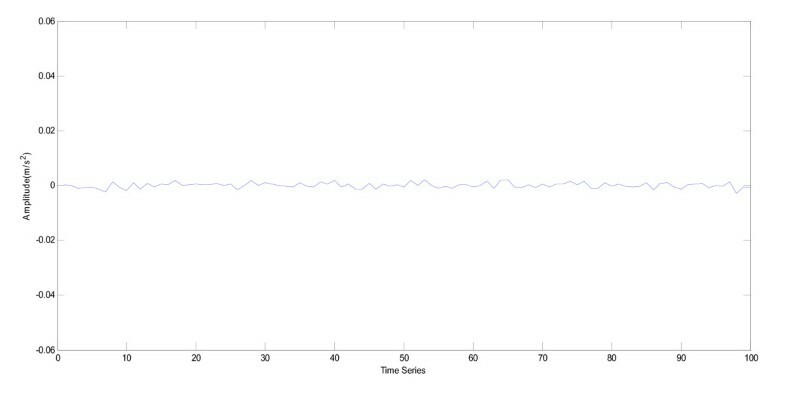 In this case, 800 points of time series data from the vibration signal without fault were used for the construction of detection model. As a whole, 800 data points were divided into training and testing dataset. The first 600 samples were employed for network training, the next 100 samples for the determination of the optimal weighted factor ω, and the last 100 samples for determination of the threshold of fault detection. After training and testing, prediction model of normal state can be determined. The parameters of CPRBF are shown as below. Figure 11 shows the residual error of normal data, and CPRBF based model has better prediction performance with an accuracy of about 10-6. Residual error of normal data. Dry friction is probably caused by fatigue crack, surface wear, or cavitation erosion, etc. In case of this failure, with the increasing of moment coefficient between rotor and valve plate, contact stress grows and oil film becomes thinner. Further, as a repetitive impact of the contact stress, the surface of valve plate is fatigued and spalls. As a result, dry friction appears, with an increment of motion gap of hydraulic pump and a decrement of volumetric efficiency. Meanwhile, the dry friction inevitably generates additional vibration signals in the valve plate's shell near the high pressure chamber. In this article, 100 points of time series data from the vibration signal with valve plate rotor wear were used for detection according to the aforementioned method. Figure 12 shows the residual error of valve plate rotor wear. Residual error of valve plate rotor wear. Dry friction, caused by oil impurities or small holes on plunger ball, etc., usually results in wear or burnout of the faying surface between swash plate and slipper, which probably causes the falling of slipper, and affects the performance of hydraulic pump. Similar to the above case study, 100 points of time series data from the vibration signal with wear fault between swash plate and slipper of hydraulic pump were used for fault detection. Figure 13 shows the residual error of wear fault between swash plate and slipper. Residual error of wear fault between swash plate and slipper. Threshold value is a key point in fault decision-making, due to uncertainties in practical and external disturbances. The rate of fail-to-report increases if the threshold is too large, vice versa, the rate of false alarm would increase. Appropriate threshold should be selected according to the analysis, with the support of residual error evaluation function proposed, on hydraulic pump's normal and faulty data. Two groups of normal data and six groups of faulty data from a testing hydraulic pump were used for analysis. Residual error series were obtained, respectively, via residual error generator designed using CPRBF network, and each variance of residual error series was calculated correspondingly. Table 2 shows the variance values. It can be seen obviously from Table 2 that, two magnitude levels of residual error's variance values between normal and fault states are clearly distinct. According to experience, the threshold can be determined with a standard of 10 times higher than the mean of variances under normal states. Here, Jth = 3.196e-005. It should be also noticed that, the threshold standard must be re-adjusted according to different working conditions. The variance values of the above two cases are 3.7781e-004 and 1.7305e-004, respectively. These values are greater than Jth, thus, the fault can be detected based on the variance of residual error signal. It is shown from the simulation results that, CPRBF network model, in conjunction with phase space reconstruction, show better capabilities and reliability in predicting chaotic time series, as well as a high performance of convergence ability and prediction precision on short-term prediction of chaotic time series. The experimental results show that, CPRBF model has high ability in approximation to the output and state of a normal system, which is useful for fault detection. The CPRBF network can memorize various nonlinear states or interferences of a system with normal states, therefore, the actual system output will be different with the predicted output of CPRBF network once any anomaly occurs, and the system can be regarded as faulty state if the residual error exceeds the threshold. Thus, CPRBF network based method is effective to real-time fault detection. 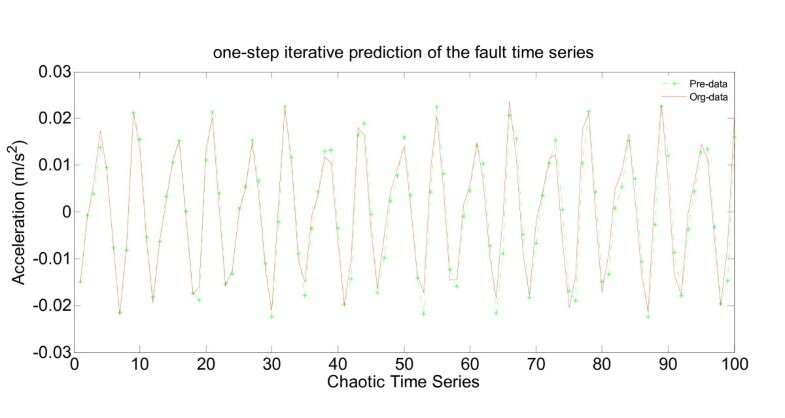 However, it is also shown from the experiments that different types of faults might represent the same fault form, accordingly, the proposed method is not suitable for performing fault location but for conducting condition monitoring. Further work will focus on how to isolate any type of fault and identify its fault classification. This article mainly aims to discuss the feasibility and possibility of practical fault detection for hydraulic pump using neural network in conjunction with chaos theory. A commonly used neural network in the past and now, namely, RBF network was employed for fault detection for hydraulic pump in conjunction with chaos theory. Certainly, methods using chaos theory combined with other popular ANNs should be also our emphasis in the following works. As known, support vector machine (SVM) has been widely applied in many fields. Compared with other ANNs, SVM overcomes many defects, such as over-fitting, local convergence. In addition, SVM has advantages over other ANNs, in terms of robustness and prevention of curse of dimensionality, etc. Thus, our further work will focus on SVM in conjunction with chaos theory, especially for those modified SVM. The research is supported by the National Natural Science Foundation of China (Grant Nos. 61074083, 50705005), as well as the Technology Foundation Program of National Defense (Grant No. Z132010B004). The authors are also very grateful to the reviewers and the editor for their valuable suggestions.